Health, wealth, and happiness are the hopes for your perfect celebration. Tip the scales of luck with these auspicious eats. Seattle-based chef Jason Wilson (Miller’s Guild, The Lakehouse, Civility & Unrest) created the menu for this luck-themed celebration. He chose scallops for any couple hoping to have a baby soon after marriage. “This plate is about celebrating a family. The brassicas on the plate are a family of vegetables, so it’s celebrating that as little pieces of Romanesco, broccoli rabe, cauliflower, and radish. It’s the notion that here is an existing family and we’re adding fresh weathervane scallops to it.” We’re pairing this with a Four Roses Single Barrel whiskey. “Whiskey is about putting your faith in that it’s going to be better after time than it is today. It’s putting your faith in a relationship that’s going to grow into something more,” says Joe Dietrich of Civility & Unrest. 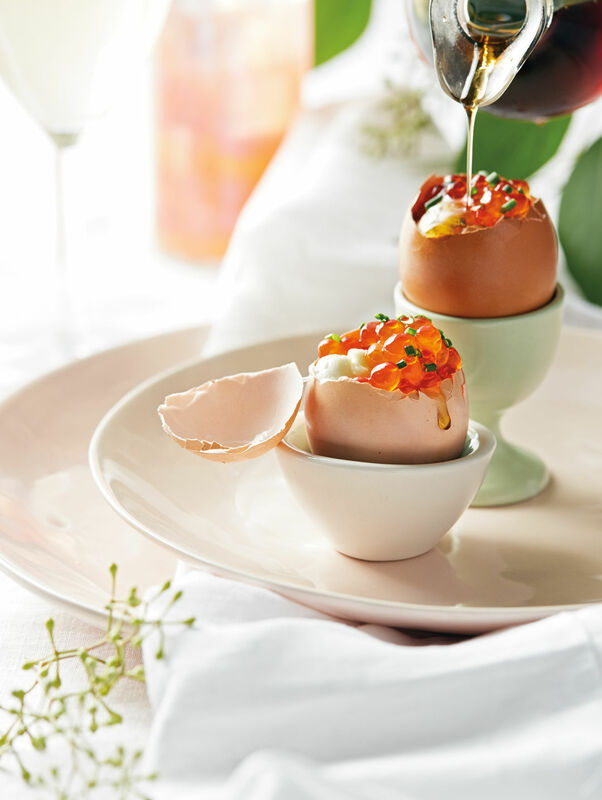 Egg cup, call for pricing, West Elm; vintage egg cup, stylist’s own; blush stoneware, call for pricing, Cost Plus World Market. The Chinese word for prawns is “ha,” or the sound of laughter. Serving prawns at your wedding can represent the laughter and joy that is felt around friends and family. 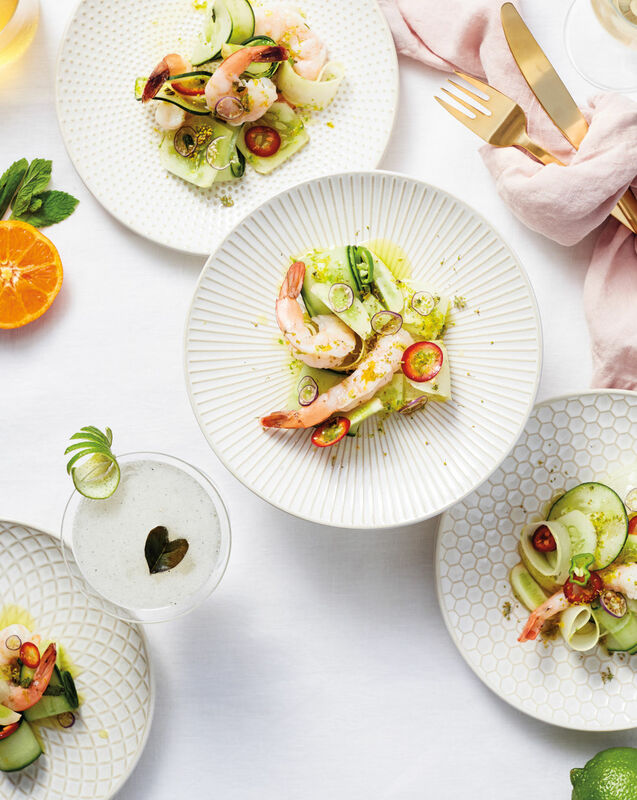 This cool and spicy cucumber salad with tangerine, lime, chile, and prawns is a dish that represents balance and longevity. Ribbons that bind things together are considered lucky, while noodles represent longevity. Cucumber sliced into ribbon-styled noodles hits on both, while the prawns showcase the lucky color red. “The prawns and chile are hot, while the mint and lime are cooling. The two balance each other out, and we often hear that relationships are great when they’re balanced—yin and yang,” says Wilson. Consider pairing this dish with a Makrut limeade with gin, fresh lime, Makrut lime leaves, and toasted cardamom. Textured stoneware, $7.99 each, Cost Plus World Market; brushed gold cutlery, call for pricing, West Elm; glassware and napkin are stylist’s own.